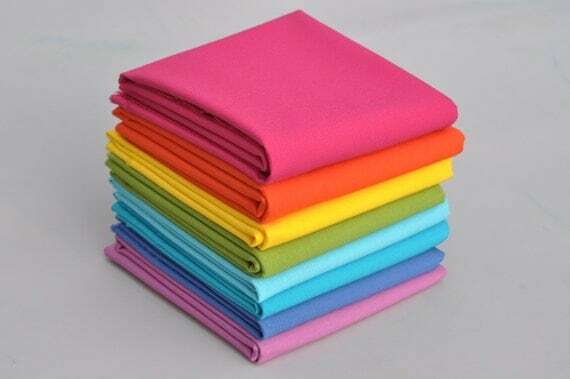 Today is Sew Mama Sew Giveaway Day, and to celebrate, I'm giving away a stack of Bella Solids 'Brights' Fat Quarters. There are 8 colors and they come from Moda's Fall 2012 collection. How lovely, right? They are in stock at Westwood Acres. We'll keep this short and sweet. :) To enter to win, leave one comment on this post telling me what color combo you are into right now, for sewing or quilting. I'll choose one winner via Random.org on Friday, December 7th, 2012 at 8 p.m. EST. Open in U.S. only. Congrats to commenter #395 Angie, who said, "I'm loving plum, grey, and aqua right now. I love reading all these comments to get inspiration! Thanks!" If you haven't stopped by, make sure you check out the Craft Buds Giveaway Roundup, with lots of current giveaways to enter! You are always welcome to link up your craft supplies or handmade giveaways, so it's a great way to promote your blog or shop. Red and green, for the holidays! The French Cottage look - Pale Blue and Yellow! I am liking tangerine aqua and gray. I'm loving grey, sage green and purple right now - so cool! Thanks for the giveaway! purple and teal. Thanks for the giveawy! I'm into purple with tangerine. Weird, I know. Thanks for the giveaway. I'm working on a wall hanging my 5 year old granddaughter designed with scraps. It's very multi-color. She saw the circles on the selvages and said they were addresses, so she had to make houses. Then she said to make birds flying by cutting out curvy V's. I've learned a lot from her! I'm loving really bright Pam Kitty Morning colors and basically anything with Kona Snow. Thanks for the chance to win. I'm in a navy mustard phase right now. Thanks for the chance to win. All Christmasy in my sewing room, lots of red and green. I am very much into aqua and orange. And Christmas colours for the season! Thanks for the chance to win. I am into bright colors. Scrappy prints or solids with a solid color background. Currently I'm sewing with red and green. I'm making a How the Grinch Stole Christmas quilt for my three year old. I'm totally into red and white right now. Oh yay! I'm into red and yellow, which is a new thing for me, so still a bit iffy about how it will work out ;) Thank you for the giveaway! This is going to seem totally child-of-the-80s, but I am loving pink and purple right now! Red & white always for me. Thanks for the giveaway! I always love those bright colors! But for the moment - according to the frosty weather we have here - I´m especially in love with purple and green / Tula Pink Nightshade. Sorry, I have to try again: I always love those bright colors! But for the moment - according to the frosty weather we have here - I´m especially in love with purple and green / Tula Pink Nightshade. I love rich colors right now. Deep purples and navy with charcoal lightened up with a little gold. :) Thanks for the chance to win! I've been very into magenta and aqua. But still collecting them for the quilt! Working on a new project in my mind in brown, orange, and green after coming down from eggplant and gold. Well, I'm not sewing much...but it's pretty much got red and then white...Christmas fabrics. I am planning with Joy...it's a beautiful line of fabric. My favorite for many months now is aqua, lime green and bright yellow. I love turquoise plus....fill in the blank. Especially lime or gold. I'd love to play around with some bright solids...great giveaway! Anything citrus-y plus bright white! Planning a blue and white quilt for a spring wedding gift. I'm loving grey and teal! I am into grey and aqua with a touch of yellow. Pink and Orange is still with me after my Princess and the Pea quilt. I bet once I start on another quilt it will be another color combo! I love yellow and gray. Right now I love teal, orange, red and black together. I've got a bundle of fabrics that I'm trying to do something with. What a beautiful stack of solids! I am into green and aqua these days. Thanks. I'm loving gray, aqua, and yellow right now. I'm loving natural (that oatmealy shade?) and any muted "christmas" color (red/green). Anything with grey or brown! Esp pink! I always love all shades of blue & orange. I'm really loving pink, ivory, and chocolate brown right now. I am really liking the teal and gray combos. Thanks! I'm loving yellow with grey tones right now. Very Wintery with a hint of Summer :) Great giveaway! I'm loving gray and yellow ---- and I'm usually not a yellow person. I always am in love with rainbows. Right now I love green and blue together! Great giveaway. I love blues, greens, and greys right now! I'm really into blue/yellow/white at the moment! It is raining/snowing outside and it is grey. So I would just go for colors different than grey/white/black! The bundle you put together would be perfect to brighten a dark day like today! I'm working on a quilt with different shades of brown and pink called chocolate and cherries. I always seem to drift toward limey greens and teals. Wonderful giveaway. I am doing a lot of red and blue together. Thanks! I am still loving orange, aqua and white! I am doing yellow and gray for bee blocks today. Thanks for the chance! My granddaughter wants brown, teal and green for her new room. Thanks. I really want to make a quilt out of gray, lime green, and navy blue! I'm really drawn to gray right now - combined with just about anything else. Oh lovely! I've been doing lots of red and green for holidays but have also been planning a quilt for my son who told me he likes red and blue the best. I might add in some grey and white, and am excited! Great giveaway, thanks!! I'm liking salmon or coral with orange or tangerine and a little brown in the mix. I'm making a quilt for our grandaughter Talya with these colors. Aquas it's always about the aquas. Love your mix up though. Thanks for the giveaway!! I have some aqua and red Bonnie and Camille prints I'm ready to work with. Thanks! I like lime, aqua, yellow and grey. Thanks for this lovely giveaway. Loving yellow and aqua these days. Thanks for the chance to win! I'm still into aqua and gray. Gray, turquoise, and coral. But my girls love purple, silver, and candy pink, so I work with those an awful lot! Gorgeous! As for combos....I love bright and just about anything with a little green in it! Love GREEN! Orange/Aqua never gets old either and I'm always drawn to bold prints with red/yellow too. I'm really into natural (that beige-y oatmeal color with the bitty specs) combined with muted colors. Rainbow and text, that's my favorite right now. So pretty! I love grey and yellow right now. Right now I am into purple and green with pops of red and teal. I am into aqua & coral. Always. Teal and purple have been tripping my trigger - and I always love yellow and gray or yellow and black. Thanks for the opportunity to win AWESOME fabric. I love greens all year round but as we head into the coldest time I'm longing for greens and yellows to remind me of what the sun looks like!! I've been using red/blue/yellow and variations thereof (cream/aqua/berry pink, etc.). I love the bella solids line, great hand. I'm really into black and white prints mixed with bold colors. I really like yellow and pink and yellow and orange - bright shades only. They're such energetic combinations! Thanks. Red & green of course...it's Christmas time. I will always love working with various shades of blue, but right now I'm knitting a gift with yarn that variates from purple to green - it's very fun! I really like aqua, yellow and gray. I love bright, rainbow colors. Thanks! I'm into blue and brown combos right now. I love turquoise, gray, and yellow at the present moment! Yellow and gray right now - but also alot of blue with a new baby boy! I am into just about any color mixed with aqua. Lately it's been orange & yellow. So bright & cheery for these dark nights! Hot pink and bright orange!! Pink and green are my perennial favorites for garments and other little things, but I have a quilt project lined up that uses aqua, orange, yellow, and green from Moda's Birds and Berries line. I'm pretty excited about it because I'm going to be working with a color scheme that's a little bit outside my comfort zone. I'm loving red and aqua! Pink and orange is my favorite color combo, but right now I'm sewing and knitting with silvery blues and grays. I'm in love with most things Fig Tree. I'm always into monochromatic with a pop of red. Acid/citron green and grey. With a bit of reddish-purple! I love the bright-colored fabrics you're giving away. I'm loving jewel-toned fabrics right now. Thanks for the chance to win! Blue and yellow is a perennial favorite. Jewel tones for me. Thanks for the chance. Believe it or not, I am ready for some bright spring colors, those FQ would be perfect! I like blue shades with purple. Thanks for the giveaway! Definitely orange and aqua right now. I'm almost up for my bee month and I think that's what I'm going to go for. Thanks for a fun giveaway! I know it's so 2 years ago, but I'm still loving grey and yellow! I am really into gray and orange. Im still hooked on soft yellow and grey, throw in some Moss green and swooon, LOL! Thank You and Happy Holidays!!! mustard yellow, turquoise & grey. orange and blue, for right now. red white and blue, just finished a quilt top for "Quilt of Valor" thanks for the giveaway! Pretty stack! I'm loving orange, aqua, and navy right now-so fun! I just washed fabric yesterday for a new quilt in shades of muted blue and purple. It's going to be really pretty and I'm very excited about it. I'm loving bright pink and yellow. Orange, pink and aqua blue! Definitely reds, greens, and golds for the holidays. I've used blue and orange several times now in my quilt. Thanks for the chance to win. Aqua, blues & greens. Stuck on this color combo. I have to name a specific color? But.....I want them ALL!!!!! :D Hmmmm....the yellow and the blue......for sunny blue skies! Reds and aqua or gray with anything! Thanks! Right now, I'm into jewel tones -- so rich and nice to look at over extended periods of time. I am currently into purple and grey. I'm in a silver and blue phase, finishing up some winter flannel sewing. purple and teal.. and brights!!! I can't get enough navy and pale aqua. I'm totally into aquas, greens, and yellows. Hi Lindsay! Still loving yellow, grey, and aqua. Thanks for the chance to enter! I'm doing Christmas sewing, and I love the light blue added in with red and green. I am really into blue and yellow right now. Bright and crisp! Trying to step out of my comfort zone which is exclusively warm colors, so we will see how it all goes. Right now I'm using brown, cream and teal fabrics to sew up a couple of aprons as Christmas presents for friends. I love orange and gray right now. Red, green and blue for the holidays. I'm working on a quilt and new stockings for the family. Thanks for the giveaway! I don't think I'll ever be over orange and blue. I love modern brights mixed with texty prints. I want to try something in orange and gray. Love the brights! I love red and teal, or purples and pinks. Thanks for the give away! Super stuck on an orange/aqua kick right now! that picture is actually the perfect color combo. thanks for the chance! I'm still a fan of yellow/gray. I'm really into yellow/navy/red combos lately but I love bright colors and my stash is ridiculously cheery. Thank you for the chance to win such a sweet bundle!! I'm particularly into aqua and orange or aqua and red. Very poppy. Great giveaway! I really want to do something orange and pink! My current color combo is red and aqua, the colors for my sons 1st birthday party this weekend! Thanks for the giveaway. I love bold colors, so the brights pack is perfect! I also love how a soft gray can tone down bright aqua and yellow. Thanks for the opportunity to win! My favorite for a long time now is aqua & fushia. I just love how they look together. I have so many projects on my "to-do" list that my favorite color combinations are all over the place. However, with two little girls (one just a year), I am really liking the red/pink combo right now. Thanks for the giveaway! I would love to make something with oranges and aquas right now. I am wanting to make something purple and blue! I'm in love with gray and pink. I am loving the trend to use the grey solids with the brights. I am definitely wanting to try something like that soon.